B&C is now scheduling its TSCA Tutor sessions. The full TSCA Tutor program includes 18 hours of training. More information on the sessions is available on the B&C website. Bergeson & Campbell, P.C.’s (B&C®) much anticipated and highly acclaimed annual Forecast, "Predictions and Outlook for U.S. Federal and International Chemical Regulatory Policy 2018," is now available. In the Forecast, the lawyers, scientists, and chemical regulatory specialists at B&C and its affiliated consulting firm, The Acta Group (Acta®), offer comprehensive and highly useful observations on the fast-changing and nuanced area of domestic and global chemical legal, scientific, and regulatory issues expected to be hot topics in 2018. This 38-page document is chock-full of insights, predictions, and useful information. Happy New Year and enjoy reading our predictions! Bergeson & Campbell, P.C. (B&C®) is pleased to announce the publication of New TSCA: A Guide to the Lautenberg Chemical Safety Act and Its Implementation, released today by the American Bar Association (ABA). This new book is a comprehensive guide to the substantial revisions to the Toxic Substances Control Act (TSCA) occasioned by enactment of the Frank R. Lautenberg Chemical Safety for the 21st Century Act on June 22, 2016, to produce “new TSCA,” amending and replacing “old TSCA” as of that date. B&C Managing Partner Lynn L. Bergeson and Senior Regulatory and Policy Advisor Charles M. Auer are editors and co-authors, with contributions from B&C’s outstanding TSCA practice group, including Timothy D. Backstrom, Lisa R. Burchi, Lisa M. Campbell, Sheryl L. Dolan, Richard E. Engler, Ph.D., Margaret R. Graham, Oscar Hernandez, Ph.D., Carla N. Hutton, and Kathleen M. Roberts. Readers of New TSCA: A Guide to the Lautenberg Chemical Safety Act and Its Implementation will gain an appreciation of the fundamental shifts in the requirements and approach to chemical management under new TSCA, and will benefit from thorough analysis of a number of the provisions, including those relating to definitions, testing, review and regulation of new and existing chemicals, information reporting, confidential business information (CBI), preemption, fees, and others. A 15-page Executive Summary of the book is available on the ABA website. Reflecting on the book, Ms. Bergeson stated: “New TSCA: A Guide to the Lautenberg Chemical Safety Act and Its Implementation reflects the expert counsel and advice of seasoned scientific and regulatory professionals and, of course, the essential views of former U.S. Environmental Protection Agency regulators and scientists, each of whom knows intimately the law, policy, and science of TSCA. 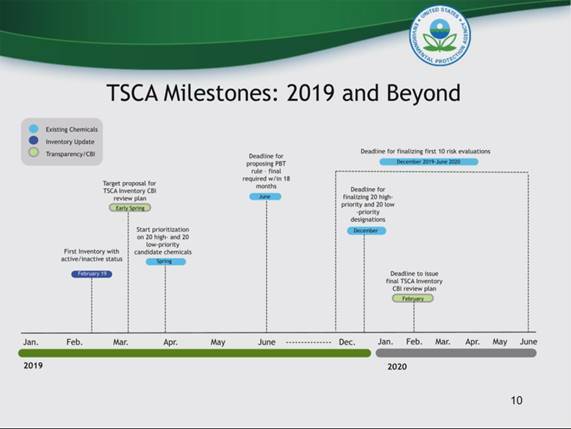 Collectively, there is no stronger, more experienced TSCA team in the country to assist the regulated community tackle the challenges posed and seize the opportunities presented by the new law." 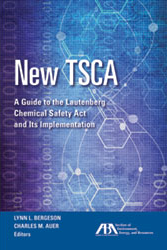 New TSCA: A Guide to the Lautenberg Chemical Safety Act and Its Implementation is available for purchase via the ABA online bookstore.